Welcome to part one of the Outbreak Developer Series. 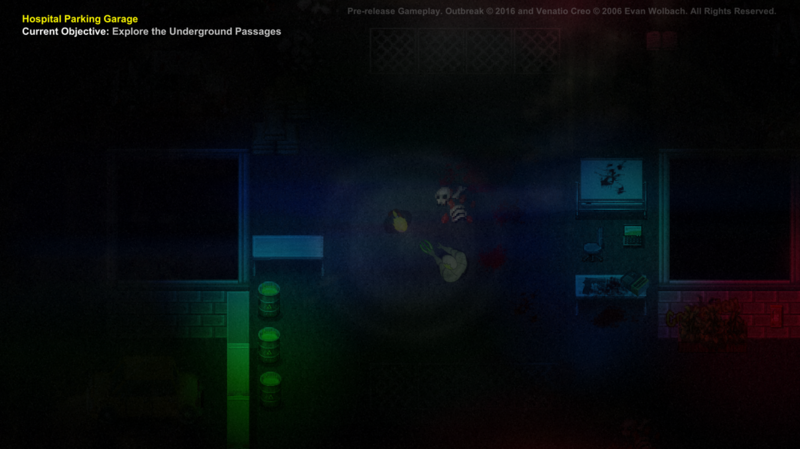 This series of topics will focus on exploring different aspects of the Outbreak game experience. We've seen a lot of chatter asking about the difficulty in Outbreak, so we're here to help explain the different systems that create tension and challenge the player. Outbreak pays tribute to its survival horror roots through scalable, intense difficulty. You're somewhat frail, you have a limited inventory and supplies are scarce. 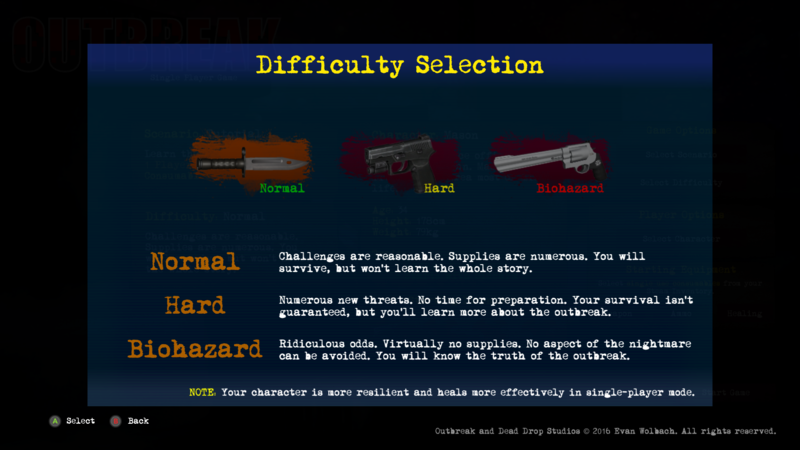 Difficulty in Outbreak scales based upon the difficulty mode chosen for the game and the number of player's present. Difficulty manifests itself in several predictable and pseudo-random ways. Outbreak's difficulty is a slow-burn, meaning that over-time the players are slowly worn down as they accumulate damage and run out of supplies. Player's begin with a significant advantage over the undead. They're typically faster, have access to firearms (although they must find them) and can handle most monsters in a 1:1 fight easily. However, supplies are scarce and limited. Your eyesight is limited. When you find yourself out of ammo and wounded, suddenly a single zombie is a significant threat. Player's also struggle to fight more than one zombie at the same time unless they're packing some of the advanced weaponry. An easy victory can turn to defeat quickly as the undead gang up on you. On any difficulty setting, each player only has a single life. There are no checkpoints, no save points or areas to return from your early demise. It's imperative to work with your friends, share supplies and support each other. If you're alone, well... you're in trouble. Enemies and supplies have set positions on the map where they will appear. However, at the start of each game, a few of them are randomly removed (more items and less enemies on higher difficulties). This encourages players to learn item layouts while still offering challenge as they cannot simply assume that a life saving health spray or clip of ammo will be where they expect it. Player's are constantly hunted by the undead. There will almost always be one or more zombies actively roaming and seeking out the players. On higher difficulties, more zombies will spawn to seek them. This creates endless tension as the player's can never be truly safe, but instead only buy themselves short reprieves by defeating the zombies. Outbreak currently supports three difficulty settings: Normal, Hard and Outbreak. Check out the Network Lobby Screen where you can choose the difficulty. On Normal, supplies are common and there are fewer enemies chasing the player. You will also encounter less enemies strewn around the map. Normal starts off fairly easy, but if you're not efficient you will run out of supplies rapidly. Hard reduces the available supplies, increases the number of enemies, increases damage dealt to players and removes some of the most powerful super weapons. You'll find some hidden passages not open on the Normal difficulty though and more of the story will be revealed. Biohazard is simply unfair. The majority of advanced weapons are removed, enemies spawn in greater numbers and you take significantly more damage. Your best bet in most scenarios is simply to flee the enemies and avoid engagements. You will need to be extremely conservative with your ammo. Biohazard is also unique because it features the Super Brute, which is invulnerable and chases your team endlessly. The Super Brute cannot be killed and is slightly faster than most common enemies. You can see a glimpse of him here. If you can survive Biohazard, you'll find even more paths available and more story elements available. You will be rewarded for your commitment. Difficulty in Outbreak ranges from balanced and challenging to simply unfair. With a single life, small inventory capacity, limited supplies and endless undead, you have your work cut out for you.